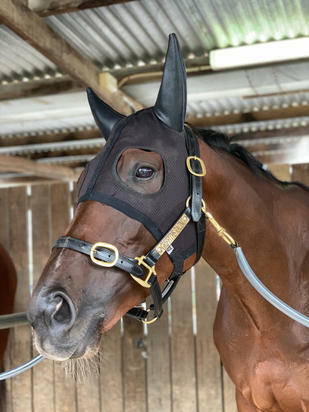 A newcomer to the stable, the promising Prahaar did not take long to strike winning form for us - at Echuca on Sunday the four-year-old Smart Missile mare appreciative of a drop in class when proving too strong for her rivals in the BM64 1200m contest. Always travelling well off the leader Rose Of Capri, the lightly raced former NSW trained mare hit the lead with 200m to go, finding plenty as late challenges emerged, her half length victory a soft one. "Mark, her owner in Sydney will be happy," Beth Schoen said - "he sent her down with confidence that Robbie would be able to help her along and it was fantastic to see her finishing off so well." "We ironed out a few of the quirks she showed at her first run for us (an encouraging Sandown fourth) and she may now head back to metro grade." "She is a bit of a quirky mare," Matthew Allen said, "but she is going well. She was the best horse in the race so it was just a matter of her doing things right and she did. It always felt like she was in control of the race." Spectators could see that Allen was kind to Prahaar over the final stages and with good reason - "you can't hit her, if you do she swishes her tail and goes slower!" Robbie was pleased to cheer home a stable double and is buoyant about Prahaar's future - "aided by a terrific ride she showed her class and I look forward to learning even more about her moving forward." A home-bred for Marquee Stud Racing, Prahaar is out of the imported stakes winning Tale Of The Cat mare Nursery Rhyme, half-sister to the US Gr.2 winner Mud Route fromastrong black type family that has had influence in this part of the world via the Breeders' Cup Juvenile winning successful stallion Success Express. Served last year by the late Sebring having produced a Medaglia d'Oro filly in early November, Nursery Rhyme can also boast amongst her relations the big race winners Greenwood Lake, Whitmore's Conn and Air Express.